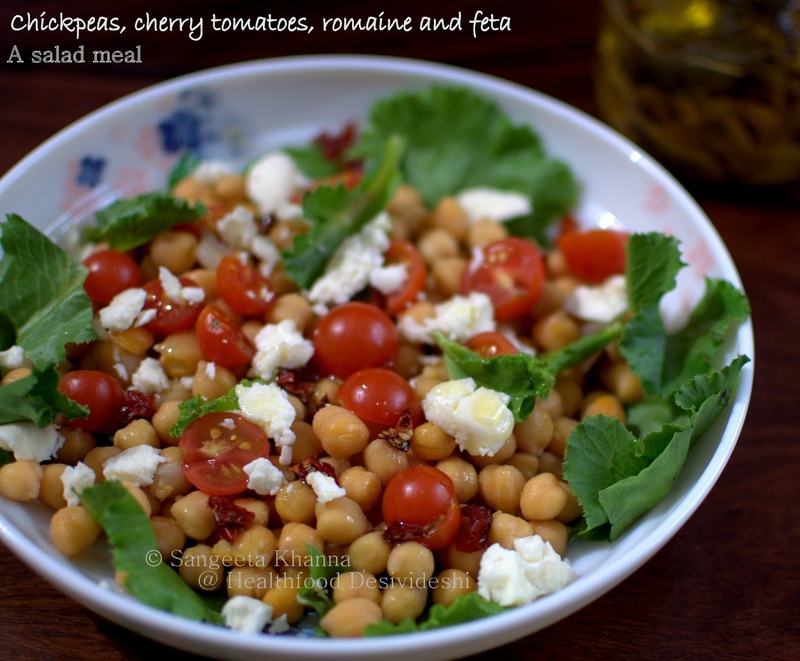 Chickpeas, cherry tomatoes and feta cheese make a nice summery salad for the Delhi type summers believe me. The cherry tomatoes are also from the garden, plucked a couple of weeks ago but they keep quite well when they are plucked after ripening on the vine. You see it is more of a garden salad for me, I would have liked some chopped pineapples in this salad too for a strange reason. No, I love pineapples any which way, that is enough of a reason. I would have included some walnuts to this salad too, but I had been munching on some walnuts since morning so skipped adding them. I can easily go overboard with nuts if I start adding them to my main meals often, so I just keep them for in between munching if required. 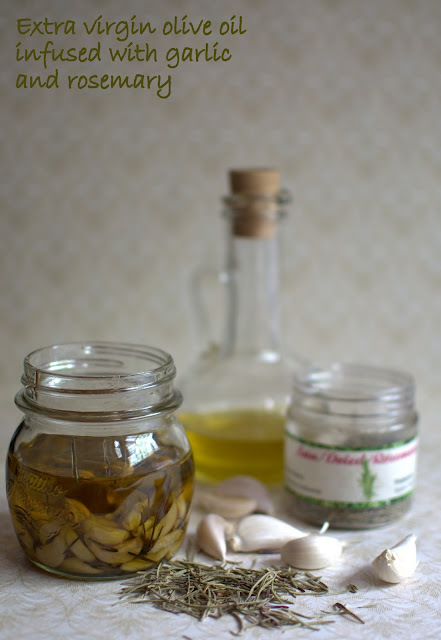 ** The garlic and rosemary infused oil is very easy to make. Just pour a cup of extra virgin olive oil into an oven proof glass bowl or measuring mug (so it is easy to pour into a jar later), add about half a cup of peeled garlic cloves and a tbsp of dry rosemary leaves, keep into a moderately hot oven (120 C) for about an hour. Cool and transfer in a glass jar. This infused oil keeps well for about 2-3 months. Tear the lettuce leaves and line the serving bowl or plate with them. Reserve the basal parts to be tossed up in the salad. Now mix everything up and toss together. Feta cheese can be sprinkled later in small blob over the tossed up salad or toss it with everything else so it gets mushy and coats the chickpeas well. Any way you like it. It is an amazing mix of textures and flavors, something I always want to have in my food. Such meals are immensely satiating as you don't feel like having a dozen side dishes to feel different flavors and the sensory pleasure that textures provide. Add walnuts or any nuts you prefer if you want, I skipped as I already had my day's quota of nuts. We can't overdo nuts in scorching Indian summers. Also, walnuts in summers might give you rashes in the palate if you overdo them. Some sunflower seeds would also be nice with it. If you don;t get romaine lettuce in your part of the world, just use any fresh greens or herbs you want, fresh fenugreek leaves will be wonderful in this salad. As would be a mix of mint and coriander greens. You don't have to sweat for finding the right kind of greens for a quick simple salad for a hot summer lunch right? Other ingredients would be common pantry staples and a few you get during the weekly vegetable shopping spree. Enjoy more salads for meals in summers, stay hydrated and stay fresh. I love salads and tend to go overboard with nuts too....especially pecans and walnuts :) I am going to make this for lunch tomm and will add your share of pineapple too. I love this. So interesting and full of flavour. Must also make your rosemary infused olive oil soon. Been long on my list of things to do. Such a pretty salad platter ...sigh, so pretty!